Has a user account, so can log in. Can add content, but only in specific areas, and can't edit anything outside of this area; users are given a "workspace," to treat as personal space where they can add content. Can not publish content so that it appears in listings throughout the site (e.g. Latest Videos page, or the front page), even content which they added; a person with manager or reviewer role must approve content for publishing. Can publish or send back any content. Can retract, or submit for publishing, any content but not publish it. Can edit any content (if it is published or pending review the Editor must be retract it first). Can view the contents of any folder from the root level. Can add content anywhere and has the power to edit anything. Can perform other site administration tasks such as users and groups management and site-wide settings. Can access the ZMI (Zope Management Interface), and use this to customise code or install products. There are two common ways of giving a Member one of the roles above: by assigning a role to that Member, or by adding a Member to a group that has one of these roles (both explained below). Members can have more than one role, the powers for each role they are assigned cascade (so for example a Member with additional Editor and Reviewer roles can edit content and then publish it). Log in as admin, or any user with Manager role. Go to Site Setup area by clicking site setup. Choose Users and Groups from the list of Plone Configuration tasks. You may wish to add a new user, rather than having that user join the site themselves. Click add new user button. 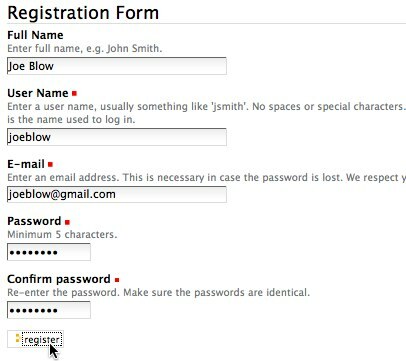 Fill out Registration Form for new user including Full Name, User Name and E-mail. Enter and confirm the password, and click register. Notify the new user of their account details, who may then log in. You can remove a user account if you wish. 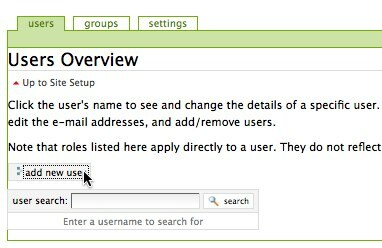 Enter the username you wish to delete in the user search box and click the search button. Check the remove user box and click the apply changes button. 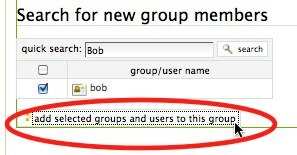 You may wish to add a user to a group, for example to the Reviewers group, which has the Reviewer role already assigned. You may also wish to use groups to jointly share the ability to edit content that you wish to collaborate on (if they group has permission to edit that content, then every member of the group does too). 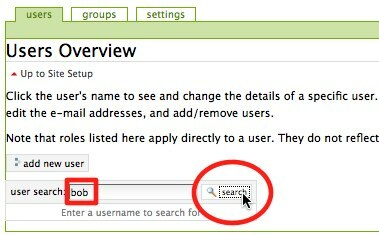 Enter the username of the Member you wish to add into the Quick search box and click the search button. Check the box next to the username of the Member you wish to add to this group and click add selected groups and users to this group button. If you choose, you can assign a role directly to a user, rather than adding them to a group which has that role assigned to it. 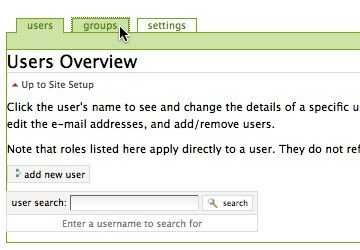 Enter the username you wish to assign the role to in the user search box and click the search button. Check the box for the role you wish to assign to the user and click the apply changes button.